A South African mayor has defended the decision to award scholarships to 16 female university students, which are conditional on them remaining virgins. Dudu Mazibuko told the BBC that the scheme was intended to "reduce HIV, Aids and unwanted pregnancy" among young girls in the Uthukela district of eastern KwaZulu-Natal province. Those receiving the bursary would have to provide proof from regular virginity tests, the mayor added. Rights groups have condemned the move. An estimated 6.3 million people in South Africa are HIV-positive, with more than one in 10 people living with the virus. The conditions of the scholarship were "a violation of the rights and dignity of the girl child", a spokesperson for the South African group People Opposing Women Abuse (Powa) told the BBC's Focus on Africa radio. "Virginity testing will never stop the spread of HIV and Aids," Idumeleng Muloko said. Kwazulu-Natal is one of the provinces worst affected in a country which already has the highest number of people living HIV in the world. Mayor Mazibuko said that neither district nor university authorities would be the ones carrying out the virginity tests. 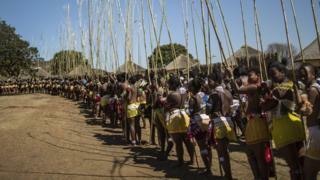 According to the mayor, those who received the scholarship would already have been tested as part of an annual Zulu ceremony, where virgin girls and women are pre-selected to perform a reed dance for King Goodwill Zwelithini. Asked whether she would be comfortable submitting her own daughters to the practice, Ms Mazibuko told the BBC that she would be, and that her own granddaughter was hoping to take part in this year's ceremony. "I think the intentions of the mayor are great but what we don't agree with is giving bursaries for virginity," chairman Mfanozelwe Shozi told AP news agency. "There is an issue around discrimination on the basis of pregnancy, virginity and even against boys. This is going too far."